The largest touchpad for Windows offers smooth tracking and a frictionless feel, but is ultimately hurt by a lack of certain key multi-touch gestures. Touchpads for the desktop are nothing new; we’ve seen the capacitive surfaces integrated into a wide variety of keyboards for well over a decade now. Likewise, standalone touchpads have also been manufactured by companies like Cirque for some time, so why haven’t we seen any widespread adoption of touchpads outside of laptops? The universally small touch surface factor may very well be what’s to blame. Apple has taken to this market with their oversized Magic Trackpad, but in typical Apple fashion the Windows drivers are half-baked and there’s a distinct lack of buttons. Enter Logitech’s Wireless Touchpad, an oversized pointing surface for the rest of us. Brought to market only one year after Apple, it’s hard not to draw obvious comparisons between the two. Both make use of AA batteries and the 2.4GHz wireless band. Both pads are just over 5 square inches, the Logitech Touchpad consuming approximately 5.25 x 5.13 inches of desk space. Both track up to four fingers for multi-touch gestures. Both move a mouse pointer on the screen. Yet despite the overbearing similarities in function and size, there are some key differences to note between the two touchpads. First, the wireless connectivity is slightly different. 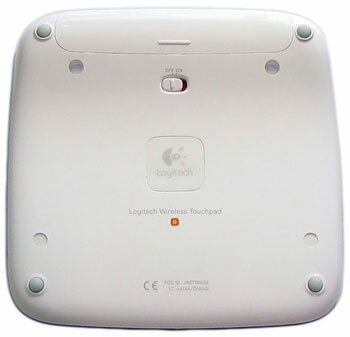 Whereas Apple makes use of the Bluetooth wireless standard, Logitech uses their proprietary Unifying wireless protocol that allows for up to six compatible Logitech devices to be connected to a single receiver. In essence, this amounts to any Logitech device (e.g. K800 keyboard, M570 trackball) that has an orange star logo. While convenient if you only ever use Logitech peripherals, I personally feel that the move comes at the expense of consumer choice. Granted, the nano receiver is small enough to be unobtrusive and performs on-par with Bluetooth wireless, but that still doesn’t excuse the need to waste yet another USB port if Bluetooth was already available. Logitech is a member of the Bluetooth SIG and has multiple Bluetooth products on the market, so their use of the Unifying protocol just seems like an unnecessary exercise in vendor lock-in. The next major difference between the Magic Trackpad and Logitech’s Wireless Touchpad is that the latter actually has proper buttons located below the touch surface, just as you’d expect to find them on any laptop that’s not made by Apple. True, the advent of multi-finger “tapping” gestures in touchpads means you no longer *need* discrete buttons, but over the years I’ve found that I still prefer buttons if only for their reassuring tactile feel and the elimination of accidental taps when I’m trying to make fine pointer adjustments. Both buttons are light enough to click without any undue force, and both extend fully to the outside edges of the touchpad. This means that the right-click button can be activated with a pinky finger, though I find the requisite wrist movement to be a bit of a strain. Unfortunately the current SetPoint 6.32 drivers lack any alternatives to the right button in the way of two or three finger clicking, but I’ll cover this more later in the Gestures section of the review. Another key difference between the Magic Trackpad and the Wireless Touchpad is the touch surface itself. Apple’s contender is made of aluminum-framed glass, which looks great but has the downsides of greater cost and the potential to crack if dropped. Logitech stuck to more conventional plastics for their surface, which feels rather nice to the touch and bears little friction on my fingertips. The surface is a far cry better than the junk they put into most HP laptops that I’ve used, though I’m unsure how users with corrosive sweaty palms would fare in terms of both friction and long-term durability. The Wireless Touchpad’s touch-sensitive area also differs from the Magic Trackpad in that it does not cover the entire surface of the unit, instead limited to approximately 3.75″ x 2.63″ as indicated by four engraved L-shaped brackets. But before you yell “gyp!”, have heart that the Wireless Touchpad’s sensor is still a good deal larger than any other PC-compatible touchpad and plenty wide for four well-spaced fingers. In my few weeks of testing the unit I haven’t found myself in the least bit constrained by the brackets. The top and bottom edges of the touch surface align closely with the natural borders of the battery hump and buttons, and the small gap on the sides only becomes an issue when side-scrolling – a rare occurrence for me at least. Out of the box the Wireless Touchpad comes without drivers, and to be perfectly honest it doesn’t need any. 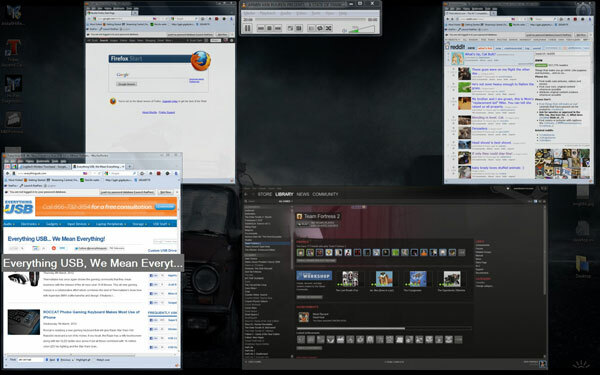 Each of the multi-touch gestures that you can see in the screenshot below are natively supported by Windows 7 through the use of emulated keyboard shortcuts. That’s not to say the drivers are without merit, however. 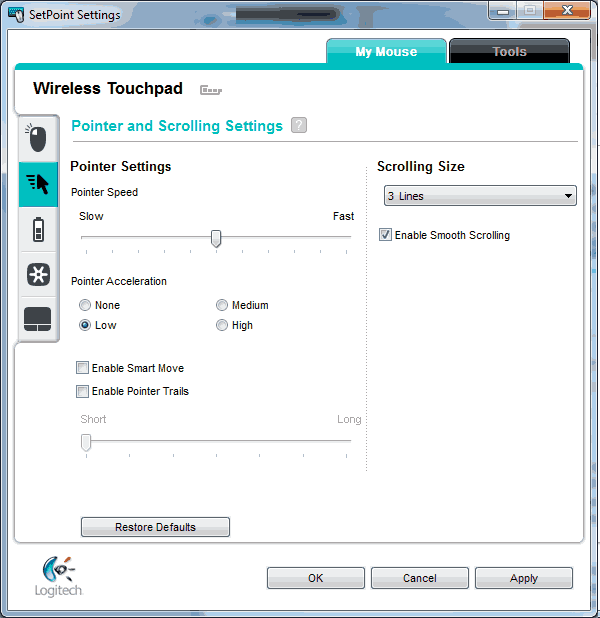 Installing the latest SetPoint 6.32 drivers from Logitech’s website allows the disabling of unwanted trackpad features such as tap-to-click, as well as offering control over pointer acceleration and scrolling speed. There’s also a software battery life readout to supplement the LED low battery indicator sandwiched between the left and right buttons. The last notable feature that the drivers offer is a replacement of Windows’ application switching menu (Ctrl+Alt+Tab) with a clone of Exposé from Mac OS X. Though this substitute application switcher has the obvious benefits of larger window previews and better ease of access than Windows’ Aero Flip 3D (Ctrl+Win+Tab), I find myself disliking it because the window zooming animations are just too darn slow. The current SetPoint drivers don’t allow reverting to the Windows application switcher or tweaking the preview speed, which is rather unfortunate since I prefer to have the drivers installed so I can disable tap to click. At least the default Alt-Tab functionality can still be called upon by the keyboard. Sadly the Wireless Touchpad falls short of other touchpads when it comes to multi-touch gesture support. Pinch-to-zoom and rotate are notably missing, something I find rather inexcusable in this day and age of tablet computers and smartphones. 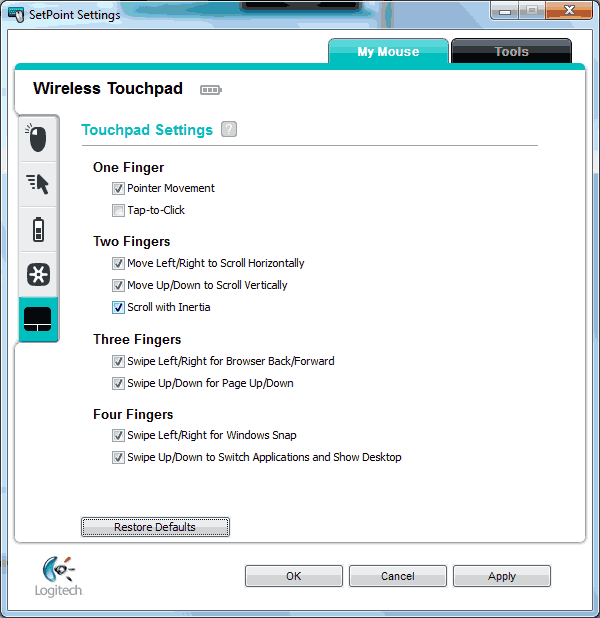 It’s not that these two gestures can’t be licensed or implemented in Windows; both Synaptics and Cirque feature them in their touchpad drivers, so why can’t Logitech? As it stands the best way to zoom with the Wireless Touchpad is to hold Ctrl on the keyboard and execute a two-finger scroll, but that’s not as natural or convenient as a simple pinch gesture. Also missing in action are two and three-finger clicks and taps for right and middle clicks respectively. The lack of a two-finger click particularly bothers me since I now have to angle my wrist at an awkward position in order for my pinky to hit the right-click button. And sure, I can always use Ctrl-LeftClick to open new tabs in Firefox, this is still not nearly as convenient as being able to use a single handed gesture. Though it’s possible that Logitech may one day release a new SetPoint version that adds additional gestures, I’m not going to hold my breath. It’s been a good six months now since the Wireless Touchpad hit shelves and Logitech hasn’t uttered a peep that any new features are coming. I must say that I’m rather pleased with the tracking performance of the Wireless Touchpad, with smooth cursor movements on the desktop and no interruptions or dropouts despite my living in a wirelessly-cluttered apartment complex. The touchpad’s precision is actually better than what my Asus G72GX’s Synaptics pad can muster, which I already considered to be rather good. Overall I’d say Logitech’s Wireless Touchpad is up to snuff for general office productivity and web browsing, but there’s a number of reasons I wouldn’t want to use it as my daily driver. For one, I don’t find the Wireless Touchpad or any touchpad for that matter to be ergonomic. Having my hand constantly splayed out above a flat surface, with or without a wrist rest, is nowhere near as comfortable as letting my palm rest atop the curvature of a nice gaming mouse. The lack of an ergonomic two-finger right-click is all the more concerning for my already-troubled wrists. If you’re looking at the Wireless Touchpad as an alternative to mice for ergonomic reasons, you’d be better off going for a decent trackball or vertical mouse. Second, despite the Wireless Touchpad’s impressive precision next to other touchpads I’ve worked with on laptops, it’s still not able to compete with a good stylus or mouse when it comes to minute adjustments or moving in a straight line. This is a huge blow for anyone who needs to do graphics work in Photoshop, but I can also see it being just enough of an issue to make Visio diagrams unpleasant as well. Finally, the Touchpad is ill-suited for any serious gaming outside of Flash websites and point-and-click adventure titles. I have an undying love for first person shooters, but the touch latency and need for constant finger lifting is just enough to make moving in Quake practically impossible. Forget trying to pull off any rocket jumps, let alone any snap-180 turns. Couple this with the bad ergonomics and lack of easily accessible buttons and it’s easy to understand why touchpads are never seen at LAN parties, though I’m probably preaching to the choir on this point. 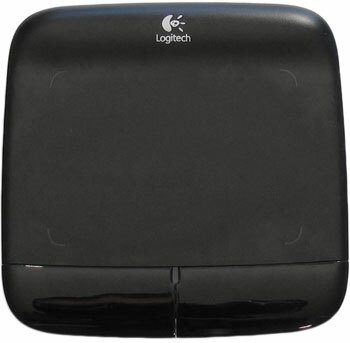 Logitech’s Wireless Touchpad is by no means a bad product; the touch-sensitive area is plenty large, the surface feels wonderfully frictionless, tracking is smooth and the wireless appears to be robust enough to use in a wireless-saturated apartment complex. But for all of these excellent features, the Wireless Touchpad ultimately suffers from its meager offering of multi-touch gestures next to its smaller competitors, desperately lacking a proper two-finger click and pinch-to-zoom. With a street price as low as $35 online the Wireless Touchpad is still a good value for casual desktop users, but for now the mouse is going nowhere.